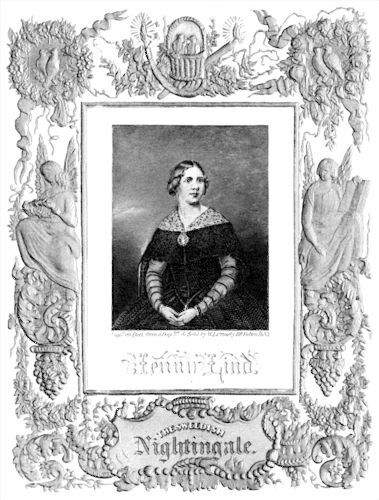 Jenny Lind – Johanna Maria Lind (1820 – 1887) was a Swedish opera singer; she was called the Swedish Nightingale because of her beautiful voice. She sang in many cities in Europe, became a friend to royalty, and even went to America. She donated the proceeds of her American concerts to founding free schools in Sweden. 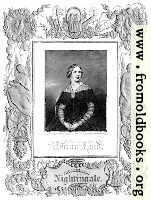 From 1855 she lived in England, and later taught at the Royal College of Music in London. At the time this portrait was published Jenny Lind had just arranged to come to America, and there was uncertainty about whether it was wise for P T Barnum to risk $1,000 on her concerts; they ended up raising over $350,000, a vast sum for the time. The portrait itself has the label, Engraved on Steel from a Daguerreotype & Sold by W. L. Ormsby 116 Fulton St. N.Y. 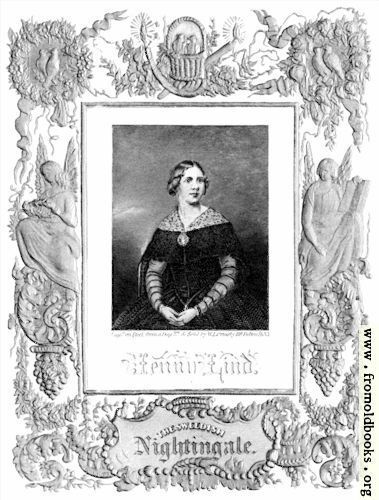 Separate images are available with the portrait of Jenny Lind and the ornate frame around the picture.